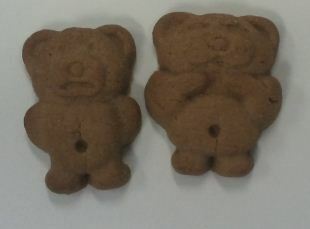 We continue with the Tiny Teddy theme, this time to take a peek at the Tiny Teddy Variety Pack. This contains individual packets of Tiny Teddies suitable for snacking. Three different varieties are included; Honey (which we looked at previously), Chocolate and Choc Chip. 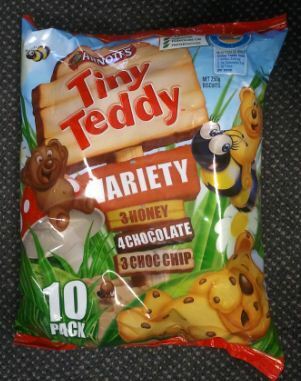 Each individual bag contains fourteen teddies; at 25g per bag there is a price for the first person to work out the average weight of a single teddy. All six teddy designs are once again in attendance, although with only fourteen in a bag it is by no means certain that you will get one example of each in every bag. By my calculations, you have about an 8% chance of getting a bag which is missing at least one teddy type (assuming even distribution of teddies). 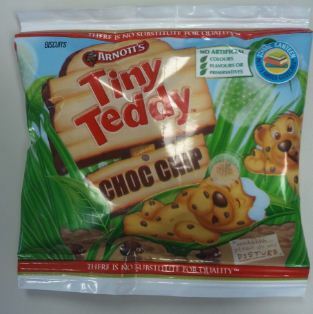 The basic Tiny Teddy formula is there in all the varieties; a crunchy biscuit that is quite chompable. The choc chip variety wodul better be named ‘choc flecks’, as they are quite the smallest chocolate chips I have ever seen. They give the teddies a kind of diseased appearance, as if they have leprosy. The chocolate chips are quite hard to detect, and the biscuits barely have a chocolate taste to them although they are quite pleasant. The choc variety are, erm, choc coloured, and do taste much more chocolatey. Also quite pleasant. The real problem here seems to be the portion size; fourteen tiny teddies is just not enough. I think these are aimed at kiddies lunch boxes though, so perhaps fourteen was the most they could put in and still get an ‘amber’ in the school lunch tick mark thingy. 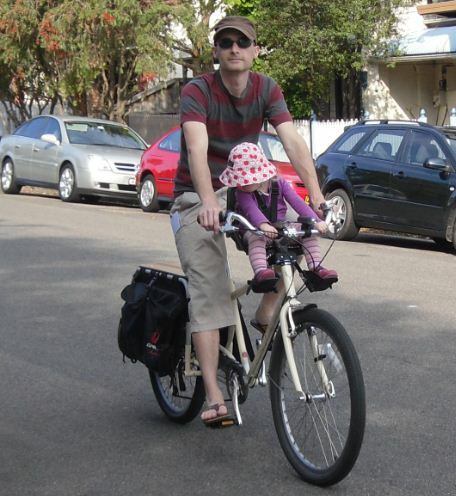 I finally got around to doing something I’d been meaning to do for months – get a child seat so I can take Toddler Chillikebab with me on the bike. What finally prompted me to get it was necessity; it seems with the various schedules for Mrs Chillikebab, Baby Chillikebab and Toddler Chillikebab I was going to need a way to get Toddler Chillikebab to her oh-so-middle-class-structured-playgroup thing without using the car. I had been mulling whether to get the custom kiddie seat that fits on the back of the Radish, or one that goes on the front. The one on the front had more appeal, but they can get in the way of pedalling; indeed one bike shop I went in to ask about them told me they had stopped selling them as everyone was bringing them back because they couldn’t ride the bike with them. But the Xtracycle one seemed rather expensive, and it was going to take ages to come, and then I saw a BoBike seat in the window of the bike shop around the corner, so I bought it. I fitted it to the bike, and we were ready for our first ride! Toddler Chillikebab seemed quite content to be put in the seat, and happily fiddled with the lights and the bell as we set off. I had promised her we would be going to the park, but we made a detour first to post some letters. ‘Are you enjoying the ride?’ I asked her once we had been going a few minutes. She took the whole thing in her stride, didn’t mention anything about the bike but pointed forward and said ‘Park! Go to park!’. Clearly she was quite comfortable with the whole bike thing, except for the fact that it wasn’t getting to the promised destination fast enough.